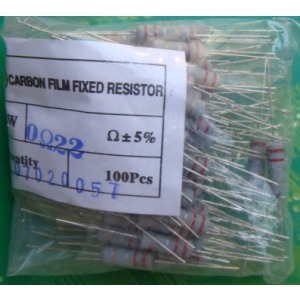 Carbon film fixed resistors 0.1 ohm 1W, 5%. $5 per 200 PCS. 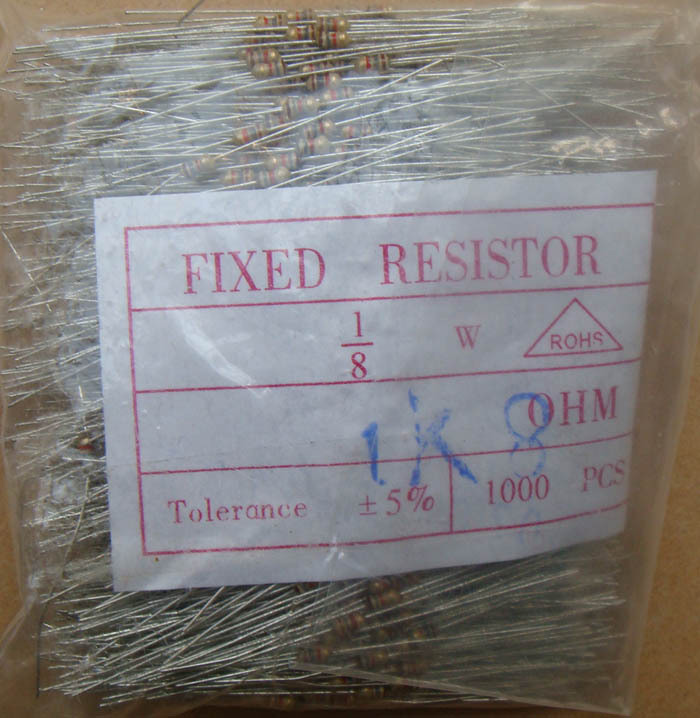 Carbon film fixed resistors 0.15 ohm 1W, 5%. $5 per 200 PCS. 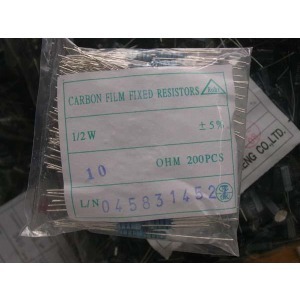 Carbon film fixed resistors 0.22 ohm 2W, 5%. $5 per 200 PCS. 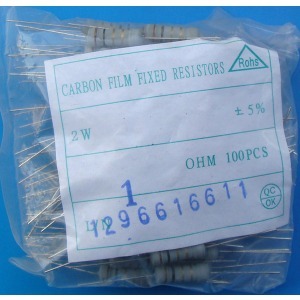 Carbon film fixed resistors 0.33 ohm 1W, 5%. $5 per 200 PCS. 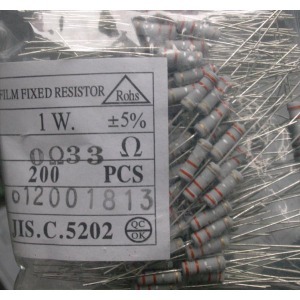 Carbon film fixed resistors 0.39 ohm 1W, 5%. $5 per 200 PCS. 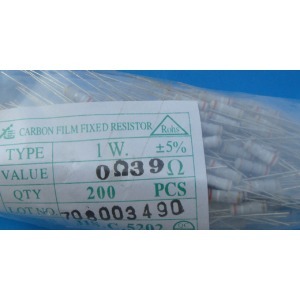 Carbon film fixed resistors 0.39 ohm 2W, 5%. $5 per 200 PCS. 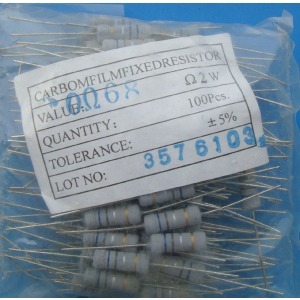 Carbon film fixed resistors 0.5 ohm 0.125W (1/8W). 5%. $3 per 1000 PCS. 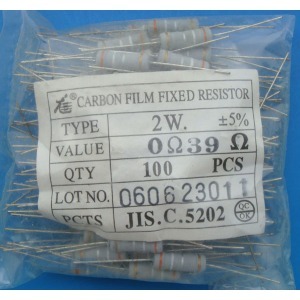 Carbon film fixed resistors 0.5 ohm 0.25W (1/4W). 5%. $3 per 1000 PCS. 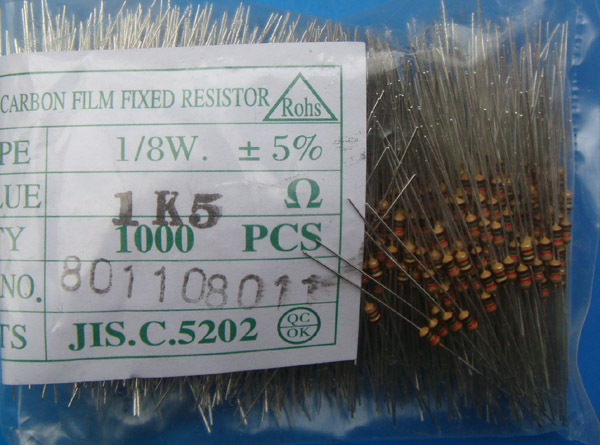 Carbon film fixed resistors 0.5 ohm 2W, 5%. $5 per 200 PCS. 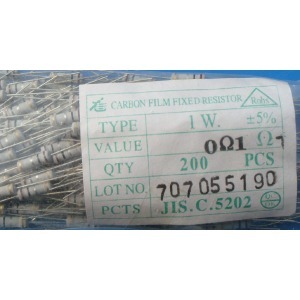 Carbon film fixed resistors 0.68 ohm 2W, 5%. $5 per 200 PCS. 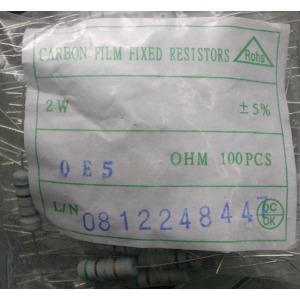 Carbon film fixed resistors 1 ohm 0.5W (1/2W). 5%. $3 per 1000 PCS. 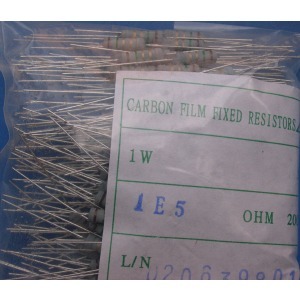 Carbon film fixed resistors 1 ohm 1W, 5%. 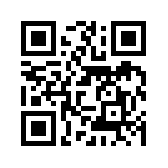 $5 per 200 PCS. 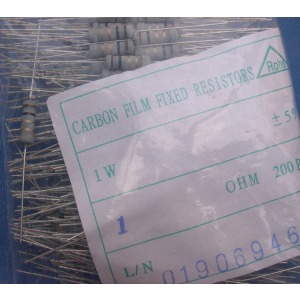 Carbon film fixed resistors 1 ohm 2W, 5%. $5 per 200 PCS. 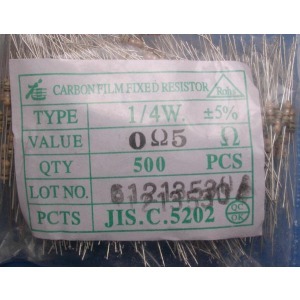 Carbon film fixed resistors 1.2 ohm 2W, 5%. $5 per 200 PCS. 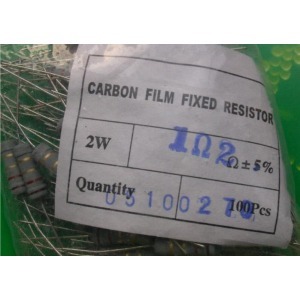 Carbon film fixed resistors 1.2K ohm 2W, 5%. $3.5 per 200 PCS. 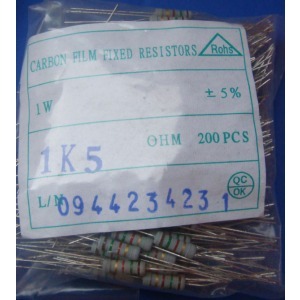 Carbon film fixed resistors 1.5 ohm 1W, 5%. $5 per 200 PCS. 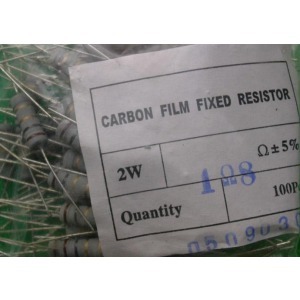 Carbon film fixed resistors 1.5K ohm 0.125W (1/8W). 5%. $3 per 1000 PCS. 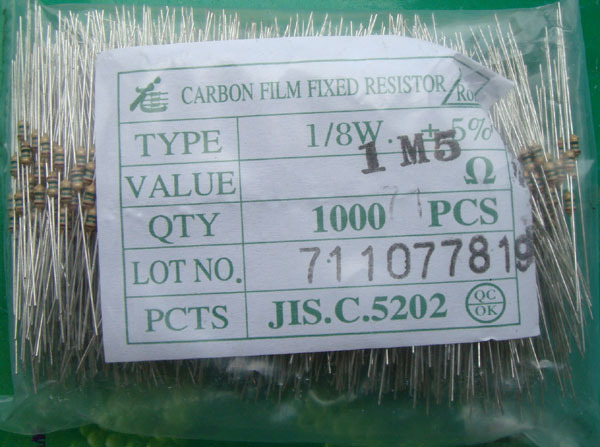 Carbon film fixed resistors 1.5k ohm 1W, 5%. $3.5 per 200 PCS. 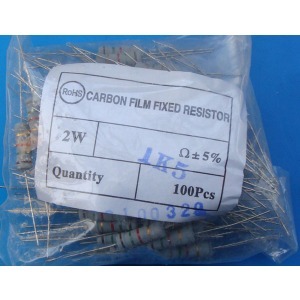 Carbon film fixed resistors 1.5K ohm 2W, 5%. $3.5 per 200 PCS. 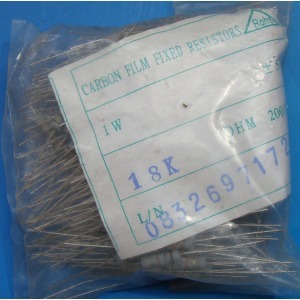 Carbon film fixed resistors 1.5M ohm 0.125W (1/8W). 5%. $3 per 1000 PCS. 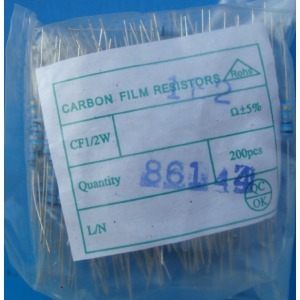 Carbon film fixed resistors 1.8 ohm 2W, 5%. $5 per 200 PCS. 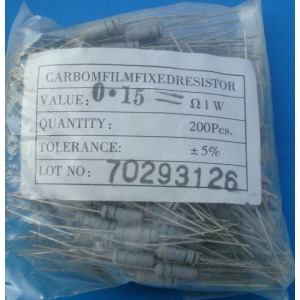 Carbon film fixed resistors 1.8K ohm 0.125W (1/8W). 5%. $3 per 1000 PCS. 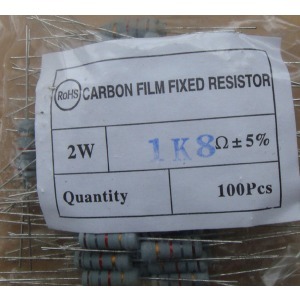 Carbon film fixed resistors 1.8k ohm 1W, 5%. $3.5 per 200 PCS. 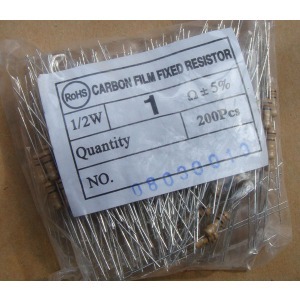 Carbon film fixed resistors 1.8K ohm 2W, 5%. $3.5 per 200 PCS. 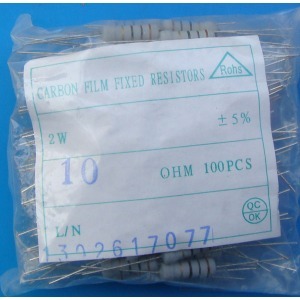 Carbon film fixed resistors 10 ohm 0.5W (1/2W). 5%. $3 per 1000 PCS. 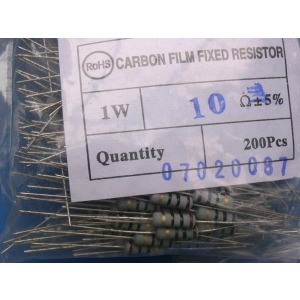 Carbon film fixed resistors 10 ohm 1W, 5%. $3.5 per 200 PCS. 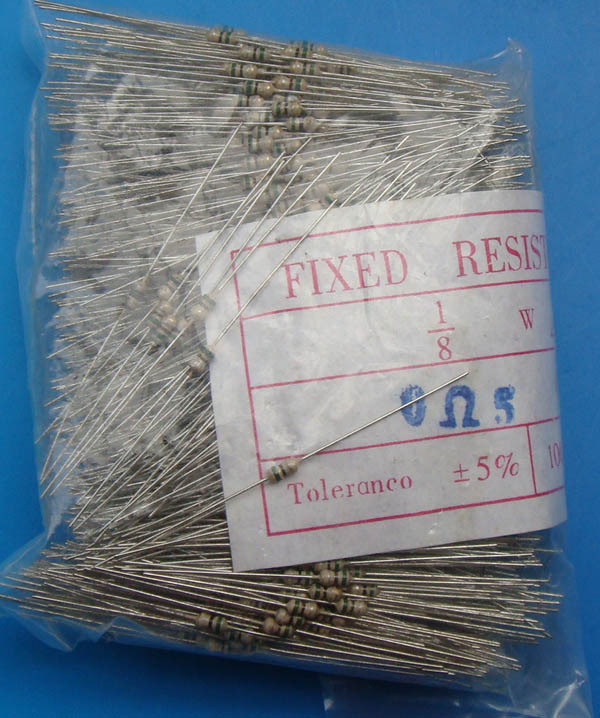 Carbon film fixed resistors 10 ohm 2W, 5%. $5 per 200 PCS.